Pokémon Quest & Let's Go! 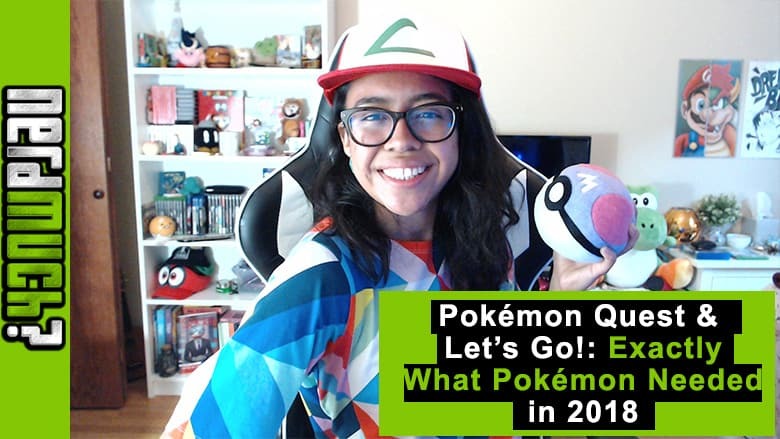 Are Exactly What Pokémon Needs in 2018 | Nerd Much? We wanted it and they delivered (early). Pokémon news is here! We can expect a mainline game in 2019 but until then we have some Pokémon goodness to hold us over: Pokémon Let’s Go Pikachu!/Eevee! (November 2018) and Pokémon Quest (available now on Nintendo Switch and coming soon to mobile devices). All of these titles are considered spin-offs from the mainline Pokémon series: meaning the gameplay and premise is inherently different than what you can expect from the core series. That being said Let’s Go Pikachu/Eevee! isn’t far off, as it’s technically a remake of Pokémon yellow. Players will be able to walk with Pikachu or Eevee (and dress them up which is what’s most important here). Local co-op is available as well so you can finally go on an adventure with someone else. Instead of the traditional battle system players will catch Pokemon with one joy-con: Pokémon GO style. And that’s not the only way Let’s Go draws on Pokémon Go. Pokémon caught in Pokémon GO can be transferred over into this console title. There’s even an optional peripheral: The Pokéball Plus, a Pokéball controller that you can use to play the game that also functions similarly to Pokémon GO Plus. So even when you’re not actively playing, you can be aware of what’s going on in the game. Pokémon Quest is something else entirely. For starters the Pokémon are cubes. But more importantly the gameplay is a huge deviation from mainline Pokémon (which makes sense give its spin-off status). Battles are extremely bare bones and instead your focus in on strategically upgrading your Pokémon’ abilities and getting ingredients to make recipes that will attract Pokémon, allowing you to catch them. It’s not groundbreaking but it’s a bit of quick fun and that’s exactly what mobile Pokémon has become: really enjoyable in short bursts but lacking the depth of console titles. Overall, all these titles serve their own purpose while working to bring in new players, bring back old players, and make all of us, indefinitely, Pokémon obsessed.